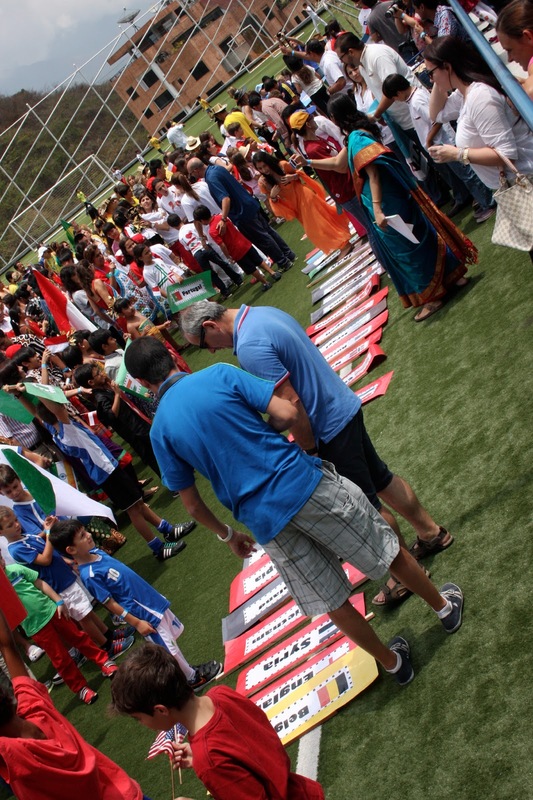 One of my favorite things about international schools is the international fair. I always loved the Festival of Nations hosted by the International Institute in St. Louis, an opportunity for groups of resettled refugees to display their pride in their country's food and craftmanship. And our college had an international fair each year, too - the same opportunity for international students to put their culture on display. But the international fair at an international school has a different flavor to it, I think because the majority of the kids are international. The fair began with a parade of nations. We marched with American flags and the girls' wore their Old Navy flag tees. And I learned that as an American living abroad, we each should own one piece of "American" clothing. The embassy's DCM led our section, and wore a red gingham shirt with cowboy boots - very Americana. We hung out for the rest of the afternoon, Dave and I eating as much as we could - Syrian food, Lebanese food, Korean food and Indian food; the girls snacking on pretzels the size of their face from the German booth and racing from one ride to the next. We're already looking forward to next year.